Only Administrator or Analyst accounts can download data from Thematic. Administrators can view and download data from all data sets, Analysts must have permission to access a data set to download data from it. Downloading your data from Thematic will come in a .csv file and contain the columns Thematic has analyzed, with additional columns for the identified themes and sentiment score of each response. 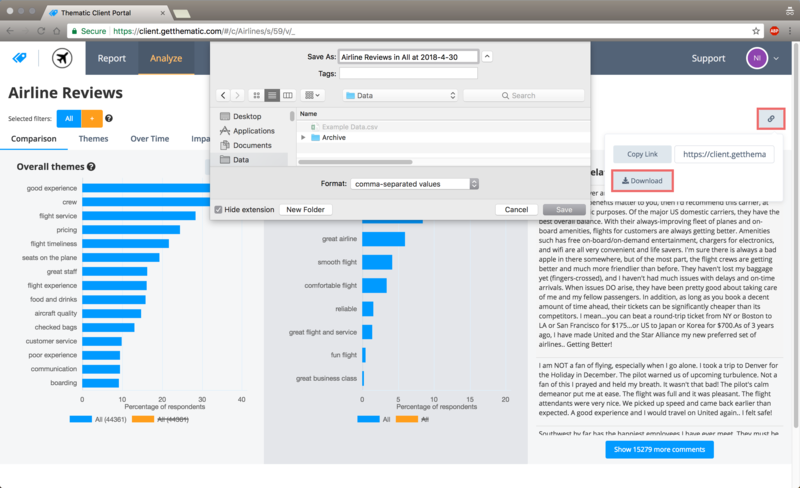 Open the data set with any analytic tool, clear any blue filters and open the download/share menu and click download. When prompted choose the file save location on your computer. The file will be named after the name of the data set and the date of download. Large data sets may have a time delay between clicking download and choosing file save location. Open the data set with any analytic tool and select the filters to apply to the downloaded data in the blue set of filters. Open the download/share menu and click download, then when prompted choose the file save location on your computer. The file will be named after the name of the data set, any applied filters and the date of download. Open the data set with the themes, comparison or impact tool and clear any blue filters unless you want the downloaded data to be additionally filtered. Select the base or sub-theme you want to download data from by clicking on it. Check the theme is selected in the title, "Comments related to selected theme" then open the download menu to the right of the title and select a save location on your computer when prompted. The file will be named after the name of the data set, any applied filters and the date of download.